This post is about two email clients IncrediMail and MS Outlook, their comparison and which email client is a better one? All your doubts regarding both these email clients will be answered in this post. IncrediMail is a graphical based email client. It was launched in 1999 and is still going strong with the users. The main USP of IncrediMail is that it offers users with attractive media features. It is easy to use, powerful and feature-rich. It has a fast search tool, which takes just a second to browse through all your IncrediMail mails. IncrediMail also has a fine Address book which enables to generate contacts in easy ways, user can see the popular contacts and can also assign picture to your contacts. The file format used in IncrediMail is .imm, which is an email client which works in Microsoft Windows and by Prion Network. It has graphical customization. MS Outlook is a much better email client than IncrediMail and is easily the best email client out there. Outlook has ample of advantages over IncrediMail like MS Outlook works brilliantly with active directory, which means when a user will launch Outlook, then the active directory details are easily passed to Exchange Server. MS Outlook integrates seamlessly with Microsoft Exchange which makes using MS Outlook is a must. The interface of Outlook is very similar to the users which will cut down the bundle costs as most of the users are familiar with Microsoft Office. IncrediMail is secure but Outlook has high security. Outlook easily blocks all the foreign data and images, disallows attachments which are executable. User can set up various accounts into one set of the folders and then organize them with uniform rules. 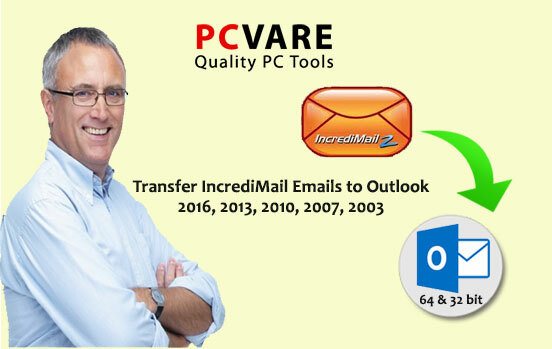 The question still remains how to transfer IncrediMail emails to Outlook 64-bit & 32-bit? IncrediMail as an email client has certain problems. IncrediMail is known to be full of bugs and crashes a lot. Users who have tried IncrediMail have given bad reviews for the email client. Many of the users are fed up from IncrediMail and now looking for some better email client and if you are one of them, then we have a solution. By using the Converter tool is the way to go with the conversion process. The converter will offer faster, precise way to do the process. The quality of the files by converter also remains same and the files do not get corrupted. If the user still has any doubts in their mind on How to transfer IncrediMail emails to Outlook, then they can try IncrediMail to Outlook 64-bit Converter. This converter will transfer all IncrediMail files easily with batch mode. Every attribute is saved into the converted emails. The converter will also take care of your attachments. It works on every edition of Outlook (64 & 32 bit). The converter creates a fresh Outlook PST file. It also find IncrediMail message store location for migration.